I was at PAX East over the weekend and had a chance to check out Oceans, the newest offering from North Star Games, which is currently on Kickstarter. Oceans is a standalone game in the Evolution family. It builds upon the mechanics in the previous game, keeping what worked and refining the rest. While Oceans does share a few common threads with Evolution, it is not just the same old game with a new under the sea theme. This is an all new experience that is heavier than its predecessor, both in terms or complexity and strategy. I was lucky enough to take a prototype copy home to play with a few friends. The basic rules are easy to read and understand. Setting up and starting a game happens quickly, even with new players. That’s not to say that it’s a simple game, but rather, the complexity comes from your decisions and reactions you make mixed with a little luck when drawing cards as the game unfolds. In total, there is almost one million different trait combinations that can be played. Much of the challenge comes from learning how to react and adjust your strategy. Like Evolution, Oceans is a game about building up species with different traits to give you an advantage as you compete to eat the most food. In Oceans though, each player takes their turn individually, instead of all at the same time. There are five phases which resolve fairly quickly, so the game moves at a nice pace once everyone is familiar with the cards. Depending on the number of players, games can last anywhere from 90 minutes to over two hours. Turns start by adding a trait to your species, or migrating the fish around on the board between the reef and ocean tiles. 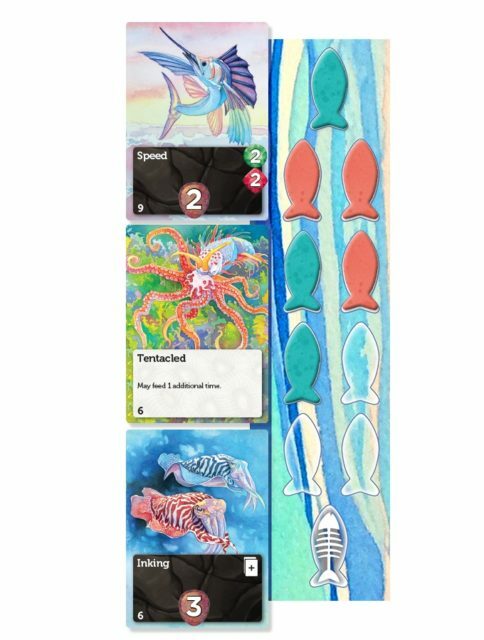 The reef serves as the main feeding ground, so using your turn to migrate fish away can be a strategic play to deny your opponents an easy meal, or to unlock scenario cards, which modifies the game or triggers an event. These scenario cards are only active when there are no fish in their respective zones, so migrating fish back into an empty zone will disable the scenario card until it empties out again. You can add three trait cards per species, some of which will let you act based on what the species to the left or right does. Other cards will give you an offensive or defensive boost. You can also replace traits at any time to further evolve a species if they are no longer providing you with a strategic advantage. Since you are restricted to a single card per turn for the first part of the game, it’s very important to carefully pick your traits. There are plenty of opportunities to catch up as the game progresses, but getting off to a good start improves the odds of winning. There are four main symbols on the cards that spell out what your creature can do. Green boosts your foraging ability, Red boosts your attack power and Blue defines how much food you passively collect when other creatures do something. Additionally, there is a shell icon which is used to determine a defensive rating, which reducing the number of population lost when you are attacked. This system makes it very easy to calculate the different values on the fly, so that your can make informed decisions as your strategy evolves. 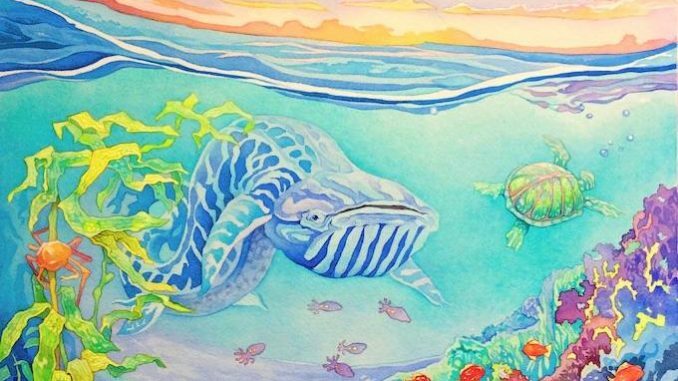 Feeding species in Oceans differs from Evolution in a few ways. First, you can only feed one species per turn. This means that it is important to play traits that work well together, so when one creature feeds the rest can gain food as well. Second, species do not have to choose between being carnivorous or herbivorous, they can comfortably exist as both, feeding from the reef or other players depending on what the board looks like on a given turn. That doesn’t mean that they can’t specialize, but it does mean that there is more flexibility when deciding how to evolve your species. Lastly, each species can only hold nine population unless a trait specifies otherwise. If a species grows to ten, overpopulation happens and disease reduces the population back to five. After the feeding phase, each species ages, losing one population which is collected to be used as points at the end of the game. Be default, each species only ages one population, though there are cards that can modify this. Then before the turn ends any species with no population left go extinct. Since this only happens towards the end of your turn, it means that creatures are not truly dead if another player attacks and brings them down to zero population. There is still a chance to bring them back. The two main decks in play through out the game are the surface deck and the deep deck. In the early game, only the surface cards can be played. These have a balanced set of traits that augment species with different abilities. These traits can make you a specialized filter feeder, allow you to leech food from you neighbors, or collect the left overs whenever a predator attacks. Deep cards can be collected and saved in your hand, but not played until the Cambrian Explosion, which is triggered when the first ocean zone is cleared of fish either through feeding or migration. Where the surface deck was balanced, the deep deck has over 75 unique traits, all of which super charge a species. Playing one of these deep cards requires you to pay for them with the points that were collected through the aging process. So if you don’t have enough points, you must wait to play these. Requiring players to pay for these cards with the points they have accumulated is one of the reasons getting off to a good start is important. The surface deck is based on traits actually found in nature, and Northstar consulted with marine biologists while designing the game to ground it in reality. The deep cards however dive into the realm of fantasy, and include cards like the Kraken, Cthulhu Leech and Hydra, adding a fun twist to the game because each of these cards is unique. Oceans brings a new layer of complexity to the game compared to its predecessor evolution. While the early phase of the game is similar, the addition of the unique traits found in the deep deck and the cost requirement to use them give a powerful boost to players who find themselves with an early points lead. Since many of the deep cards are buried as the game progresses, and since only two scenario cards are present, each play through will be different. Something that works in one game might be dead in the water the next round. Additionally, species are much more interconnected in Oceans than they were in Evolution. Symbiotic relationships for example can now link to neighboring species belonging to your opponents. It’s easier to eat, but also easier to be eaten, and there are many more ways to passively collect food. Whale Cleaner or Shark Cleaner will trigger if it is simply the closest species when another species eats enough. The addition of the overpopulation mechanic, where you lose half your population if you grow to large, adds yet another dimension, since it may be possible to force your opponents to over populate based on the passive traits they have. I have really enjoyed playing the game so far. Even though some of the traits in Oceans are similar to Evolution, the new game mechanics and turn structure are different enough so that the game feels fresh. There are new ways to build species that weren’t possible or optimal before, forcing you to think three turns ahead. The fixed amount of food and ability to move fish throughout the reef and ocean to block other players is a nice change from the communal watering hole. It’s hard to talk about Oceans with out talking about the games artwork. Oceans shares the unique visual style of the Evolution game family. 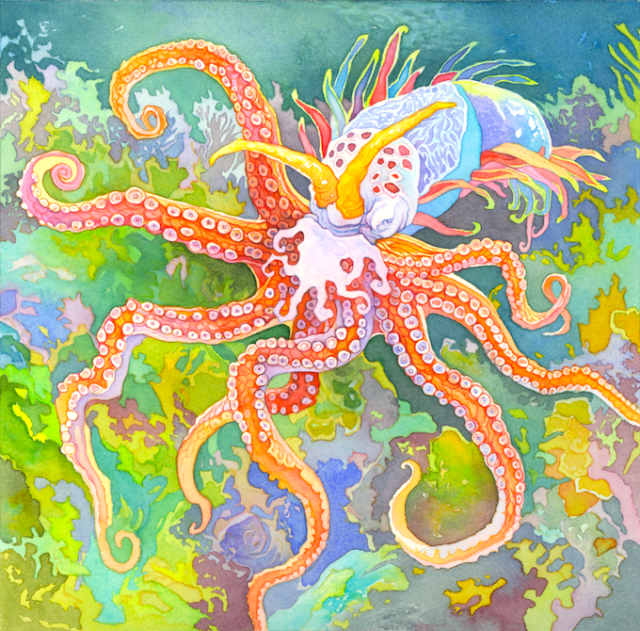 Catherine Hamilton, the same artist behind Evolution, created the stunning art for the Reef and the deck of Shallow cards. Her style is bright and colorful, and sets a thematic tone for the game. The deep cards were created by a variety of artists, reflecting their different styles while still fitting in to the games overall aesthetic. In total, there is almost 100 different pieces of artwork in this game. The Kickstarter for Oceans in currently in progress, and as of the time of writing, almost all fo the stretch goals have been unlocked, meaning that if you back this project, you’ll receive bonus deep cards that may not be available once the game appears at retail. It looks like they will be releasing additional stretch goals as the Kickstarter campaign continues. There is additionally an option to back a deluxe version of the game with nicer fish tokens and oceans themed bags, as well as various add ons. Oceans is a game with straightforward game play. It’s fairly easy to learn, but has enormous depth in devising a winning strategy. The variations introduced by the deep cards and the scenario decks should mean that no two games are ever quite alike. The new game mechanics make each decision from selecting traits to deciding who, and how, to feed an important and strategic choice. This is a game that encourages you to think several turns ahead, and to pay attention as each player makes their moves. Whether you own Evolution or not, Oceans is a great game and an excellent addition to your cardboard collection.